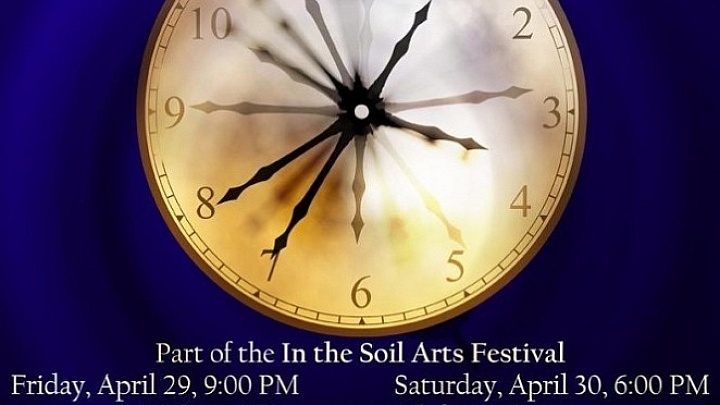 The attraction of the In the Soil Arts Festival is the valuable exposure it provides for local artists and collectives. 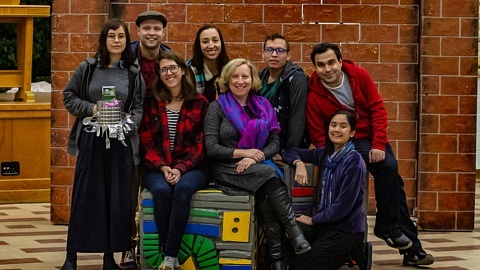 This weekend, St.Catharines’ very own Twitches & Itches theatre company graces the Robertson Hall stage at the First Ontario Performing Arts Centre for the first time with their new adaptation (by the company’s artistic director Colin Bruce Anthes) of Tim Maly’s short story Time, Again. In an action-packed 45 minutes actors Hayley Malouin, Sean Rintoul, Iain Lidstone, Sean McClelland, and Collin Glavac weave together themes of time, science, and identity through movement, choral singing, and monologue. 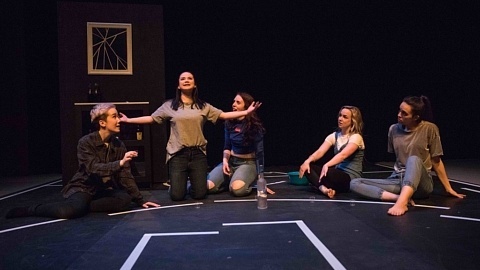 The play features scenes from the lives of various characters who maneuver the push and pull of time at what appears to be the brink of nuclear war. The Deserter (Lidstone) and The Director (Malouin) struggle to maintain their marriage despite conflicting world views: The Director is willing to further the war effort through invention and The Deserter wants no part of it. In the end time is not on their side —The Director is able to save the world with a war-altering invention, but not her crumbling marriage. The intense physical work of the actors in the show replaces the need for props and set pieces. Save for two tiny, white bouncy balls, all objects in the performance are established through mime, encouraging the audience to engage their imaginations and picture the objects for themselves. While at times certain mimed objects were unclear — in the opening of the play Lidstone seems to mime either a camera or a remote as Malouin sings — the group’s physical specificity from the tips of their fingers to their toes is meticulous. Roller coasters, coffee cups, even a fig tree — the creative limit of their bodies seems to know no bounds. Though the plot is anything but linear, consistency within scene transitions allows the audience to stick with the ensemble throughout their journey. A chorus of eerily melodic “ba ba ba’s” and rhythmic movements accompanied by coloured lighting bridges the gaps between scenes. Serial movement is used frequently to supplement the main action, as when McClelland as The General recites a grand speech calling to arms the men of America, the other four actors participate in a military-themed dance to powerful drum music. The script is comprised of found texts such as Stephen Hawking’s A Briefer History of Time which present themes that the company wished to explore. This has an isolating effect in that not all of these texts speak to subjects that are common knowledge for most audience members; much of The Director’s dialogue stems from Michio Kaku’s Physics of the Impossible which involves complex scientific terminology that — for those not familiar with the concepts of phasers and time travel — can be discouraging of attentive viewership. 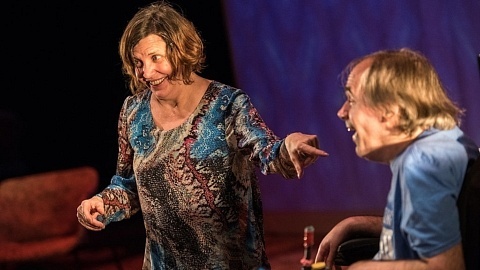 Time, Again weaves together compelling stories of love, innovation, and war. Is it a race to embrace the future or an attempt to fight against it? Twitches & Itches’ new production allows you to be the judge.